Draft: 2014, Washington Nationals, 1st rd. Erick James Fedde...Pronounced fed-EE...Attended the University of Nevada-Las Vegas...Was named the 2014 Mountain West Pitcher of the Year and to the All-Mountain West First Team…Named a Louisville Slugger Second-Team All-American by Collegiate Baseball and to the midseason Golden Spikes Award watch list…A graduate of Las Vegas High School where he played alongside outfielder Bryce Harper…Was also an all-state soccer player and helped lead LVHS to a soccer state championship in 2009…Was selected by SDP in the 24th round of the 2011 First-Year Player Draft but chose to attend UNLV. Began the season with Triple-A Syracuse..Was first recalled from Triple-A on May 23...Made his first Major League start of 2018 that night vs. San Diego (5.2 IP, 6 H, 3 ER, BB, 6 SO)... Recorded his first career win on June 29 at Philadelphia (5.0 IP, 8 H, 5 ER, 3 BB, 3 SO)...Was on the 10-day and then the 60-day disabled list from July 5-Sept. 4 with right shoulder inflammation...Made his best start of the season on Sept. 11 at Philadelphia (5.2 IP, 2 H, 2 BB, 9 SO)...Allowed just one home run in four starts from Sept. 4-23...Went 3-4 with a 4.29 ERA in 14 starts between Double-A Harrisburg and Triple-A Syracuse...Allowed three homers in 14 starts for Syracuse...All three came in one start. Began the season with Double-A Harrisburg before being promoted to Triple-A Syracuse on June 13...Had his contract selected from Syracuse on July 30...Made his MLB debut that day against Colorado (4.0 IP, 10 H, 7 ER, 2 BB, 3 SO)...Struck out Trevor Story for his first MLB strikeout...In his second start, Aug. 6 at CHI, struck out seven batters in 5.1 innings of work...Enjoyed four MLB stints with Washington...Made seven starts for Harrisburg (2-3, 3.16 ERA, 35 SO, 14 BB, 3 HR) and 10 appearances out of the bullpen (1-0, 2.63 ERA, 19 SO, 4 BB, HR)...Began his stint with Syracuse in the bullpen (6 G, 1-0, 3.86 ERA, 7 SO, BB) before moving to the rotation (6 GS, 0-2, 5.11 ERA, 18 SO, 4 BB)...Placed on the 60-day DL on Sept. 4 with a right forearm flexor strain, ending his 2017 season. Went 8-5 with a 3.12 ERA in 23 games (22 starts) between Single-A Potomac and Double-A Harrisburg...Ranked second among Nationals farmhands in ERA (3.12) and fourth in strikeouts (123)...Posted a 4.24 strikeout-to-walk ratio (123 SO/29 BB)...Was named Carolina League Pitcher of the Week on July 17...From May 23 to Aug. 5, posted a 0.62 ERA (4 ER/57.2 IP), struck out 60 batters and walked just 10 while posting a 4-1 record over 11 games (10 starts)...Following the season, was cited by Baseball America as the No. 9 prospect in the Carolina League and as having the best "Break- ing Ball" in the league...Entered the season rated as the No. 82 prospect in all of baseball, according to Baseball America ...For the second straight season, boasted the "Best Slider" in the organization, per BA. Made his professional debut...Began the season with short-season Single-A Auburn before being promoted to Single-A Hagerstown...Went 5-3 with a 3.38 ERA in 14 starts between the two stops...Posted an 8.3 SO/9.0 IP ratio (59 SO, 16 BB)...Allowed just two home runs all season...Recorded a 1.10 WHIP in six starts for Hagerstown...Following the season, was rated by Baseball America as the No. 4 prospect in the New York-Penn League... Entered the season rated as the No. 90 prospect in all of baseball, according to Baseball America. Sat out the remainder of the season after undergoing "Tommy John" ligament replacement surgery following the 2014 Draft. 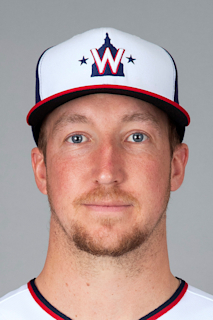 March 23, 2019 Washington Nationals optioned RHP Erick Fedde to Harrisburg Senators. September 4, 2018 Washington Nationals activated RHP Erick Fedde from the 60-day injured list. August 25, 2018 Washington Nationals sent RHP Erick Fedde on a rehab assignment to Syracuse Chiefs. August 20, 2018 Washington Nationals sent RHP Erick Fedde on a rehab assignment to Harrisburg Senators. August 14, 2018 Washington Nationals transferred RHP Erick Fedde from the 10-day disabled list to the 60-day disabled list. Right shoulder inflammation. July 5, 2018 Washington Nationals placed RHP Erick Fedde on the 10-day disabled list. Right shoulder inflammation. June 13, 2018 Washington Nationals recalled RHP Erick Fedde from Syracuse Chiefs. May 24, 2018 Washington Nationals optioned RHP Erick Fedde to Syracuse Chiefs. May 23, 2018 Washington Nationals recalled Erick Fedde from Syracuse Chiefs. May 15, 2018 RHP Erick Fedde assigned to Washington Nationals. March 22, 2018 Washington Nationals optioned RHP Erick Fedde to Syracuse Chiefs. November 3, 2017 Erick Fedde roster status changed by Washington Nationals. September 7, 2017 Washington Nationals transferred RHP Erick Fedde from the 10-day disabled list to the 60-day disabled list. Right forearm flexor strain. September 4, 2017 Washington Nationals placed RHP Erick Fedde on the 10-day disabled list. Right forearm flexor strain. September 1, 2017 Washington Nationals recalled RHP Erick Fedde from Syracuse Chiefs. August 28, 2017 Washington Nationals optioned RHP Erick Fedde to Syracuse Chiefs. August 27, 2017 Washington Nationals recalled Erick Fedde from Syracuse Chiefs. August 7, 2017 Washington Nationals optioned RHP Erick Fedde to Syracuse Chiefs. August 5, 2017 Washington Nationals recalled Erick Fedde from Syracuse Chiefs. August 2, 2017 Washington Nationals optioned RHP Erick Fedde to Syracuse Chiefs. July 30, 2017 Washington Nationals selected the contract of Erick Fedde from Syracuse Chiefs. June 13, 2017 RHP Erick Fedde assigned to Syracuse Chiefs from Harrisburg Senators. February 11, 2017 Washington Nationals invited non-roster RHP Erick Fedde to spring training. August 7, 2016 RHP Erick Fedde assigned to Harrisburg Senators from Potomac Nationals. June 16, 2016 Potomac Nationals activated RHP Erick Fedde from the 7-day disabled list. June 1, 2016 Potomac Nationals placed RHP Erick Fedde on the 7-day disabled list. April 5, 2016 RHP Erick Fedde assigned to Potomac Nationals from Hagerstown Suns. March 12, 2016 RHP Erick Fedde assigned to Washington Nationals. August 11, 2015 RHP Erick Fedde assigned to Hagerstown Suns from Auburn Doubledays. June 19, 2015 RHP Erick Fedde assigned to Auburn Doubledays from GCL Nationals. September 29, 2014 GCL Nationals activated RHP Erick Fedde from the 60-day disabled list. August 14, 2014 GCL Nationals placed RHP Erick Fedde on the 60-day disabled list retroactive to August 8, 2014. July 25, 2014 RHP Erick Fedde assigned to GCL Nationals. July 18, 2014 Washington Nationals signed RHP Erick Fedde.